One fine day I was contemplating how I could get the word out about my blog to a local audience. There are many resources online, but I really wanted something more hands on and tangible. That is when I discovered sticviews. They make custom prints that you can stick on virtually any surface. A myriad of ideas were flying through my mind as I was looking at their website and at examples of how other people have used sticviews. 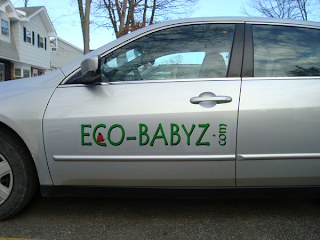 They were very kind to let me try their service and I ordered three car 'stics' of my Eco-Babyz logo, two large ones for the side doors and one small one for the rear bumper. ORDERING: The ordering process is very easy. First of course you need to create your design in a program like Photoshop. 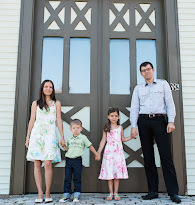 You can also just upload a photo or use an image from their image gallery. Once the image is uploaded/selected, you can specify the dimensions, shape, and material of your stic. You can also add text or color/patterns. All of this is done in a very user friendly control panel. PRICING: The prices vary very slightly for each material (cloth, white stic, clear stic, or non-sticky art paper). They are all in the range of $0.10 per square inch though (or less). So a 10" x10" clear stic costs $10.07. 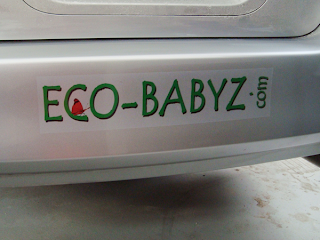 My entire oder of 3 car stics was just over $50, a small price to pay for great advertising (though sticviews generously covered the tab for Eco-Babyz this time). APPLICATION: I think the application of the stic is the trickiest part. The smaller your stic, the easier it will be to apply of course. The two stics on the sides of our car were three feet long and two sets of hands are helpful when applying a large stic. One thing to make sure of before application is that your surface is completely clean and dry. 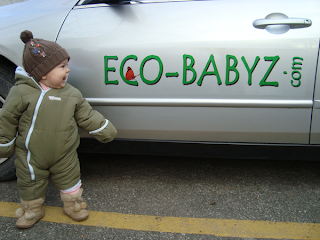 If you are applying it on a car, I highly recommend the Croftgate USA Eco-friendly waterless car wash. Your stic will arrive rolled up in a cardboard tube. The night before you plan to apply it, I suggest that your roll it out and place it under something to flatten it. This will make application easier. I did not actually do this and it was hard to get the stic edges to adhere to the surface because they would roll up. I learned the hard way about application in cold weather, so take note. It was well below zero and we applied this in a friend's garage. We sprayed a little bit of water on the sticky side from the supplied spray tube (following directions), this helps you position the stic perfectly before it actually sticks to the surface. At the same time though it creates a thin layer of milky white glue behind the stic that later dries clear. In our case though it did not dry, it froze because it was so cold outside. Then it thawed when it got warmer, and when it started sleeting (yeay, New England) water got behind the stic. So for cold weather application I suggest either applying it dry with no water (use the supplied squeegee to get the air bubbles out) or waiting until there are 5 dry, moderately warm days in the forecast. COMPANY: I always look for companies that are environmentally responsible and sticviews is no exception. While the vinyl material of the stics is not something I personally advocate for indoors, they do have the great cloth stic option that is ideal for kids rooms, bedrooms, and anywhere else in the house really. As for environmental responsibility, sticviews is powered by 100% renewable energy, they use energy star equipment, and their website is hosted on a Greenspace server. Moreover, sticviews are reusable and can give new life to functional objects that would otherwise be discarded. Sticviews is generously giving away $50 to design and create your own custom sticview of any sort! 1. Visit the Sticviews website and tell us an idea of what you would use a sticview for if you win. 2. Sign up for the sticviews newsletter on their blog or on Facebook. 6. Tweet about this giveaway (once per day). Include link to this post and tag @Ecoblogz and @sticviews! Leave your Twitter name in the comment. 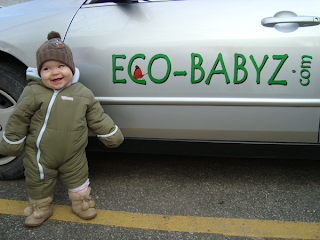 You can also become a fan of Eco-Babyz on Facebook or Sticviews just for fun. That will give you zero entries though because Facebook has new rules for promotions and giveaways. Contest ends at 11:59 p.m. EST on Sunday Feb. 14. The winner will be selected using Random.org on Monday, Feb. 15, and notified by email (so please be sure I have a way to get in touch with you). Open to US residents only. Thank you! I would definitely get a laptop skin. I would use it for tile decoration on my backsplash in the kitchen. What a cool idea! I love to get a laptop skin for my brother as a gift, or maybe a car decal for myself. I'd love to win--my fingers are crossed! I have an online boutique so I'd definitely get a SticView for my car to help advertise! I would use it for a laptop skin. My computer is so boring right now! How cool is that Microwave stic??? Love it. I would use it for garage decorating purposes. Thanks for the chance. Wall art for our Entry way. I would do a truck grapic for my son.